Texan Flight Ops offers various orientation flight programs ranging from half-hour to one-hour sorties. We promise an awesome and unforgettable experience. Upon arrival, you will meet with your instructor and begin a preflight briefing, covering and customizing the flight profile based on your personal flying experience. The instructor will begin with a thorough preflight brief; customized flight profile with your input and experience. After takeoff you will do the majority of the flying yourself, including high performance aerobatic maneuvers such as rolls, loops, Cuban eights, and wing-overs! Your flight will be recorded using our on-board digital video system for you to enjoy with friends and family for years to come. This color video includes two different camera views, inner-cockpit communication and residual engine sounds. After returning, your instructor will conduct a post flight debrief covering all maneuvers performed. 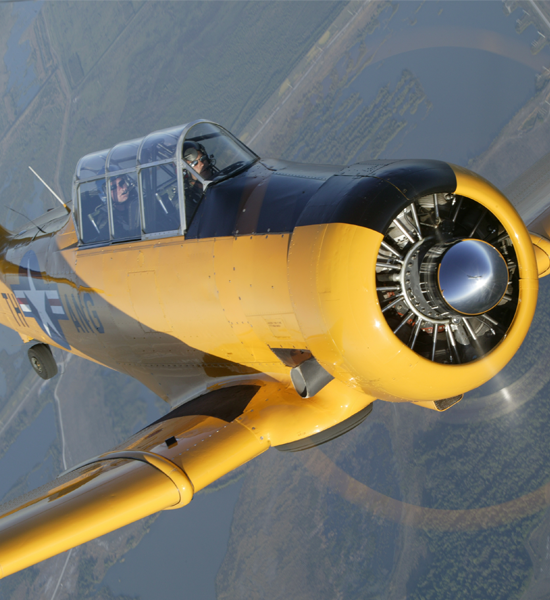 You will also receive a flight profile certificate and a picture of the Texan autographed by your instructor. This unique experience will last approximately 2 1/2 to 3 hours depending on the flight duration you request. WHAT ARE YOU WAITING FOR? GET FLYING TODAY!